Alexandria was the greatest cultural capital of the ancient world. Accomplished classicist and author Theodore Vrettos now tells it story for the first time in a single volume. His enchanting blend of literary and scholarly qualities makes stories that played out among architectural wonders of the ancient world come alive. His fascinating central contention that this amazing metropolis created the western mind can now take its place in cultural history. Vrettos describes how and why the brilliant minds of the ages--Greek scholars, Roman emeprors, Jewish leaders, and father of the Christian Church--all traveled to the shining port city Alexander the Great founded in 332 B.C., at the mouth of the mighty Nile. There they enjoyed learning from an extraordinary population of peaceful citizens whose rich intellectual life would quietly build the science, art, faith, and even politics of western civilization. No one has previously argued that, unlike the renowned military centers of the Mediterranean such as Rome, Carthage, and Sparta, Alexandria was a city of the mind. In a brief section on the great conqueror and founder Alexander, we learned that he himself was a student of Aristotle. Alexandria was the greatest cultural capital of the ancient world. Accomplished classicist and author Theodore Vrettos now tells its story for the first time in a single volume. His enchanting blend of literary and scholarly qualities makes stories that played out among architectural wonders of the ancient world come alive. His fascinating central contention that this amazing metropolis created the western mind can now take its place in cultural history. Vrettos describes how and why the brilliant minds of the ages -- Greek scholars, Roman emperors, Jewish leaders, and fathers of the Christian Church -- all traveled to the shining port city Alexander the Great founded in 332 B.C. at the mouth of the mighty Nile. There they enjoyed learning from an extraordinary population of peaceful citizens whose rich intellectual life would quietly build the science, art, faith, and even politics of western civilization. No one has previously argued that, unlike the renowned military centers of the Mediterranean such as Rome, Carthage, and Sparta, Alexandria was a city of the mind. In a brief section on the great conqueror and founder Alexander, we learn that he himself was a student of Aristotle. 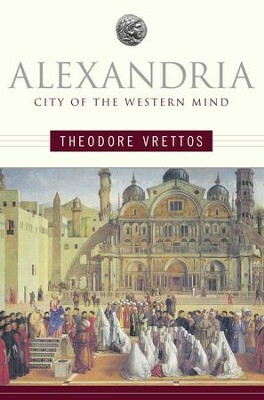 In Part Two of his majestic story, Vrettos shows that in the sciences the city witnessed an explosion: Aristarchus virtually invented modern astronomy; Euclid wrote the elements of geometry and founded mathematics; amazingly, Eratosthenes precisely figured the circumference of the earth; and 2,500 years before Freud, the renowned Alexandrian physician Erasistratus identified a mysterious connection between sexual problems and nervous breakdowns. What could so cerebral a community care about geopolitics? As Vrettos explains in the third part of this epic saga, if Rome wanted power and prestige in the Mediterranean, the emperors had to secure the good will of the ruling class in Alexandria. Julius Caesar brought down the Roman Republic, and then almost immediately had to go to Alexandria to secure his power base. So begins a wonderfully told story of political intrigue that doesn't end until the Battle of Actium in 33 B.C. when Augustus Caesar defeated the first power couple, Anthony and Cleopatra. The fourth part of Alexandria focuses on the sphere of religion, and for Vrettos its center is the famous Alexandrian Library. The chief librarian commissioned the Septuagint, the oldest Greek version of the Old Testament, which was completed by Jewish intellectuals. Local church fathers Clement and Origen were key players in the development of Christianity; and the Coptic religion, with its emphasis on personal knowledge of God, flourished. Vrettos has blended compelling stories with astute historical insight. Having read all the ancient sources in Ancient Greek, Hebrew, and Latin himself, he has an expert's knowledge of the everyday reality of his characters and setting. No reader will ever forget walking with him down this lost city's beautiful, dazzling streets. Theodore Vrettos did his graduate work at Holy Cross Greek Theological Seminary and Harvard University. Author of New York Times Notable Book of the Year The Elgin Affair: The Abduction of Antiquity's Greatest Treasures and the Passions It Aroused, he was Director of the Writers' Conference at Simmons College for thirteen years. He lives in Peabody, Massachusetts. I'm the author/artist and I want to review Alexandria: City of the Western Mind - eBook.